A 13-year old girl who is slowly losing her sight recently visited SeaWorld Orlando as they helped her with her personal vision quest. Paralympic swimmer and philanthropist, McClain Hermes, is suffering from progressive vision loss. After being told by doctors that she had less than two years before losing her sight entirely, Hermes has been on a quest to create lasting, visual memories. Hermes recently met Maple and Aurek, two beluga whales at SeaWorld Orlando’s Wild Arctic attraction. She also swam with dolphins at Discovery Cove. In her words, “It’s been a great thing to check off my bucket list because now whenever my brother and sister say, ‘oh look there’s a whale or dolphin,’ I can remember how they look, feel, and sound, and how I was able to interact with beluga whales and other animals at SeaWorld. Maple and Aurek were soft and felt like marshmallows and I loved hearing them make different noises through their blowholes,” said Hermes. 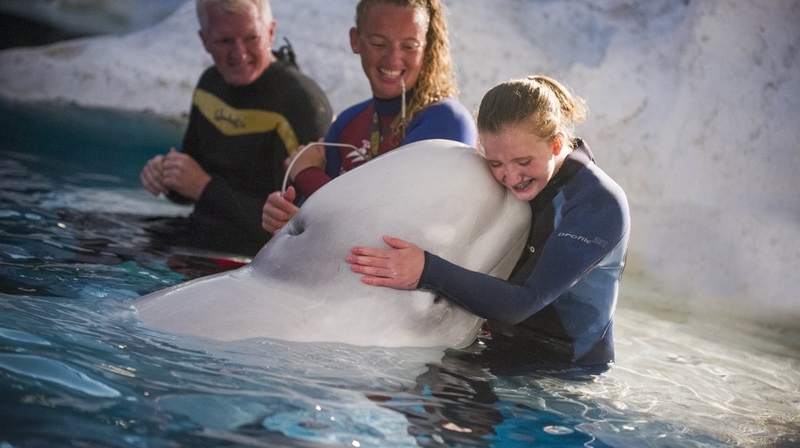 “It was incredible to share this experience with McClain and help her touch, feel and hear the beluga whales before she loses her eyesight completely. At SeaWorld, guests are able to connect with animals every day, but knowing that McClain is losing her eyesight made her visit even more inspiring,” said Kim Downs, animal care specialist who led Hermes’ interaction. There’s more to McClain than an impressive visual bucket list. She’s a swimmer ranked in the top 10 nationally in her division. Starting next year she’ll attempt to qualify for the 2016 Paralympics in Rio de Janeiro, where she aspires to be the number one Paralympic swimmer in the world. In 2009, after reading an article about recycling shoes, she was inspired to help her local community. McClain founded Shoes for the Souls, a non-profit organization that collects shoes for residents at Atlanta Mission, a local Georgia shelter. In five years, Hermes and her Shoes for the Souls have collected nearly 10,000 pairs of shoes for those in need. For more information about Hermes Shoes for the Souls visit Facebook.com/ShoesForTheSouls.